THIS IS A WONDERFUL, RARE AND HARD TO FIND WEDGWOOD BLACK BASALT MINIATURE BUST OF WILLIAM SHAKESPEARE MADE BY WEDGWOOD IN THE EARLY 19th CENTURY. THIS BUST MOUNTED ATOP A WAISTED CIRCULAR SOCLE. 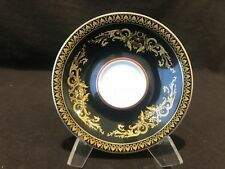 IT IS IMPRESSED "WEDGWOOD " (ONLY) WHICH DATES THIS PIECE PRIOR TO 1891 AND HAS A FEW PATTERN MARKS ON THE BOTTOM "G. " AND "< "-Moustache mark-C1840. Condition: One of the handles has been repaired (picture #3). Base has cracks and has been repaired (pictures #4-5). One small flea sized chip on the rim stripe of the body (picture #8). Two small green markings on the body (picture #9). Asbury Black is an iconic Wedgwood pattern, hand decorated in raised 22 karat gold detailing, each piece is painstakingly hand crafted. This is a lovely pattern designed by Versace and manufactured by Rosenthal. Pieces can vary by size, weight, air bubbles and markings. They may not match your pieces exactly. Price DOES NOT include duty. C.1877 ~ WEDGWOOD "BLACK" DIP JASPERWARE 10-1/2" PORTLAND SHAPE VASE CODE "CSF"
C.1877 ~ WEDGWOOD "BLACK" DIP JASPERWARE 10-1/2" "PORTLAND" UNIQUE SHAPE WITH SQUARE HANDLED VASE. YOU WILL PROBABLY NEVER SEE ANOTHER ONE LIKE THIS ONE AGAIN.WE HAVE BEEN HANDLING WEDGWOOD PIECES SINCE 1978, AND NEVER HAVE SEEN ONE LIKE THIS BEFORE. It will blend in nicely with your existing set. C. 1920 ~ WEDGWOOD BASALT 5" FTD. VASE DEPICTING STUNNING SELECTION OF "MUSES". THIS IS A VERY SCARCE VASE PRODUCTED IN BLACK BASALT WEDGWOOD. FOR YOUR CONSIDERATION IS THIS LOVELY. WEDGWOOD ROYAL WEDDING LARGE TANKARD WITH WHITE ON BLACK WITH TERRA COTTA. MINT ~ AND LOOKS STUNNING. Stunning Wedgwood teapot in nearly new condition. Wedgwood Plate from The Papal Collection in Jasper and Black Basalt from the Visit of Pope John Paul II in 1982. The plate is white on pale blue. The plate and its original packaging are in great condition. This piece came from a collector so it has been well taken care of over the years. For your consideration: A Lovely Round Lidded Wedgwood China Trinket, Powder or Jewelry Box and matching Tray. The top of the box lid is decorated with a Beautiful large depiction of a female Etruscan Dancer. For your consideration: A Beautiful Pair of Wedgwood Etruria and Barlaston Black Shell Handled Urn Vases. These Classically styled Urns have a Pedestal Base and are decorated with a lovely ribbed side. 1st Edition Kruger National Park ~ Waterbuck Dinner Plate. Made by Wedgwood, England. Large Dinner / Cabinet Plate ~ 10 3/4". First Edition of a Series of 6. One small chip on edge - see last pic. Impressed on Back: 1953. Wedgewood Caernarvon Black footed teacup. Holds 8 ounces. Gold scrolls on black band and white center. Made from 1972-1982. Bone China, made in England. Wedgwood Napoleon Ivy Black Oval Serving Platter, 14 1/2" x 11 3/4"
"Wedgwood Napoleon Ivy Black". -Oval Serving Platter, 14 1/2" x 11 3/4"-. My pictures are part of my ad. There is also a "ZOOM" that should allow you to enlarge. This is why I insure all boxes. It does have a few lines of crazing. C.1920 Wedgwood Black Basalt Jasperware Spill Vase - Classical Muses - MINT 5.5"
C.1920 ~ WEDGWOOD BLACK BASALT 5.5" SPILL VASE WITH "MUSES" OF THEATER. For your consideration: A Lovely Wedgwood Black Basalt Jasperware Patrician pattern Open Salt and Egg Coddler. The bottoms are marked:WEDGWOOD MADE IN ENGLAND. They would make an excellent addition to any Wedgwood Collection. C.1910 ~ WEDGWOOD BASALT BLACK UNIQUE 7" HEIGHT PLANTER/VASE IN NICE CLEAN CONDITION. FOR YOUR CONSIDERATION IS THE LOVELY. This is a Wedgwood bone china 8" salad plate in the black Colonnade pattern, R4340. Also note that all my Wedgwood is marked with my initials, ERR, which are easily removed. ESTIMATES ONLY! Made in England. Produced between 1959 - 1997. It is a partial service for 14, with up to 5 pieces per place setting. Fine white bone china with black pattern and gold trim on smooth rim. MINT to NEAR MINT condition! "LARGE" Wedgwood Egg Shape Lidded Trinket box or Jewelry Box with white bas-relief on black jasper, depicted a Cherub and Floral Garland. 2 5/8" tall. 2 3/4" wide. C.1930 ~ WEDGWOOD BLACK BASALT "SPILL" VASE 5.5" TALL AND LIKE NEW CONDITION. THIS PIECE IS IN EXCELLENT LIKE NEW CONDITION. YOU WOULD ENJOY OWNING THIS STUNNING UNIQUE SPILL VASE. Pattern: CAERNARVON BLACK. Piece: Demi Cup & Saucer. Manufacturer: Wedgwood. China - Dinnerware Crystal & Glassware Silver & Flatware Collectibles. Condition: Great condition for its age. Canadian and international orders. For your consideration: A Lovely Wedgwood Terra Cotta on Black Jasper Ware Square Lidded Trinket Box with Egyptian Motif. The bottom is marked:WEDGWOOD MADE IN ENGLAND 78. FLATWARE 1847 Rogers Bros. CHINA & DINNERWARE. STEMWARE & GLASSWARE. White body, black and gold pattern. STORAGE & CARE. Set includes. The colors are bright and vibrant with no signs of pattern ware, staining or crazing. 8 1/4" salad plates. C.1867 ~ Wedgwood BLACK Jasperware Trophy Plate "BELLEROPHON WATERING PEGASUS"
C.1867 ~ WEDGWOOD BLACK JASPERWARE "TROPHY PLATE" FEATURING "BELLEROPHON WATERING PEGASUS" WITH CODE PRDUCTION "V". "BELLEROPHON WATERING PEGASUS" IS THE MOST POPULAR SUBJECT PIECES USED AMONG TROPHY PLATES ALONG WITH "AURORA". Ulander Black. Oval Vegetable. Party Favors. We are located in the Lower Hudson Valley of New York State, 30 minutes away from NYC. Murano Glass. Excellent To Flawless. Dinner Plates.